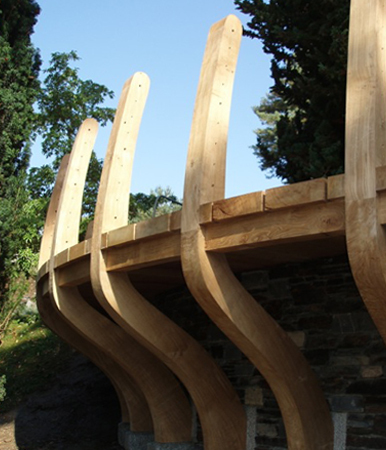 Natural oak curves have been used for centuries to build traditional oak framed houses and oak framed boats. Artisans of old knew that curved sections of oak with the grain running along the shape were a lot stronger than curved pieces cut from straight trunks. Although on the whole we like oak trees to grow nice and straight for high quality beams and joinery, we do also collect oak trees that have grown with a bit of a curve in their trunks to produce these traditional shaped sections. 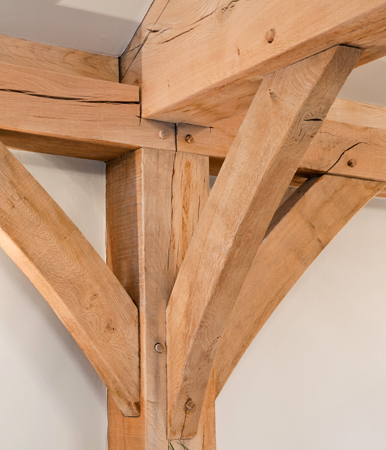 Vastern Timber specialises in the production of specific curved oak components for traditional oak framing including shaped wind and wall bracing, through & through slabs for cruck blades, sling braces, queen posts and arch bracing, all of which are selected from curved oak logs. Oak curves are cut as standard with a deflection to suit the natural shape of the tree, although bespoke patterns can be cut against a template. Oak curves for bracing are usually supplied green (wet) although they can in some cases be supplied partially air-dried. Working properties Green oak is generally easy to work but becomes increasingly difficult as it dries. Chemical properties Oak contains tannic acid which will corrode ferrous metals. When the two come into contact, a blue sludge is formed which will stain the oak. Insect attack The ambrosia beetle can attack the wet timber (30% moisture +). However, the beetle will die as soon as the wood dries to less than 30%. Re-infestation will not occur. Other dry wood will not be affected. Sapwood is commonly attacked by the powder post beetle (Lyctus spp). However, sap is normally excluded from oak beams and anything else it comes into contact with. All fixings used in conjunction with green oak should be stainless steel.